The following is a transcript of a letter to Lord Hawkesbury from the Rev. Christopher Barber COLLINSON of the vicarage, Laxton, 10th October 1908. 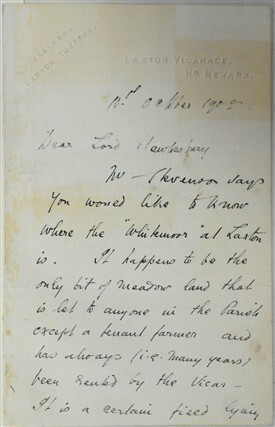 The letter was found bound inside a 19c. book on the history of Collingham (by E.G. Wake) that I recently bought (pictured). Mr Stevenson says you would like to know where the "Whitemoor" at Laxton is. It happens to be the only bit of meadow land that is let to anyone in the parish except a tenant farmer and has always (ie many years) been rented by the vicar. It is a certain field lying on the left kand side (east) of the road as you go from Laxton to Sage(?) Wood and kneesall, at the bottom of the valley - and of unenclosed open field. A strong spring rises in the valley a little higher up and its stream runs to the Trent by way of moorland also in this parish. On its course thro' this parish it is bordered on each side by a narrow belt of "black" land containing many small river shells & in some places petrified reed stems. This blacjk land is in some places covered over by a clay or marl washed down from the hills all around - and it has become dry and capable of cultivation by means of straightening of the course of the stream. The Close at Whitemoor is what my 5 acres or so of field is generally called. I suggest that the name may appropriate (?) throu' the growth of cotton grass or rush - OR through its often having been a shallow stagnent series of pools & bogs, and so looked white in comparison to the moor beyond on the dry ground. It is strange that the same name should be here on the clays as in the light sands of the forest land, - as white water and white moor. There is no reason they should not have the same origin for the conditions of the little valley here must have been identical on a small scale with those w[est?] [of] Perlethorpe. This page was added by Website Administrator on 31/10/2015.